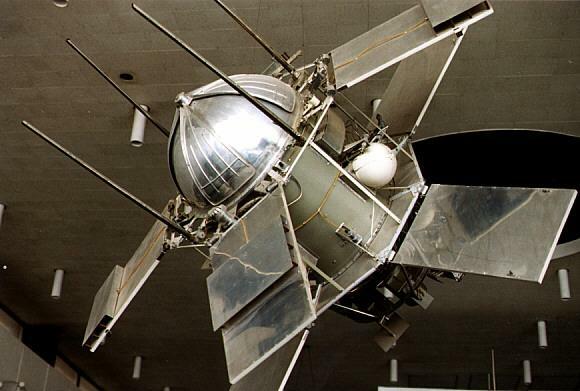 DS-U3-S satellite (Cosmos 166). 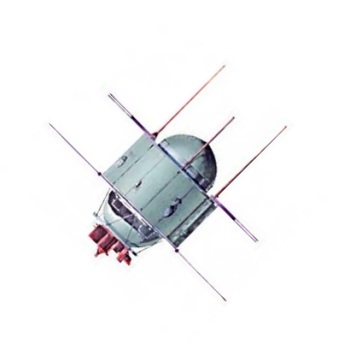 Other satellites in the DS-U3 series had a similar appearance. Ukrainian solar satellite. Specialized orbital solar observatory for measuring solar rays in multiple spectral zones. 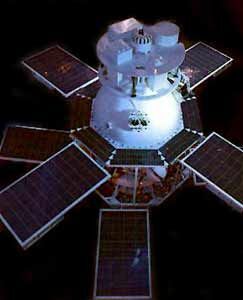 Astronomy, solar satellite built by Yuzhnoye, Russia. Launched 1967 - 1968. Status: Operational 1967. First Launch: 1967-06-16. Last Launch: 1968-07-05. Number: 2 . Gross mass: 360 kg (790 lb). Family: Astronomy, Solar. Country: Ukraine. Launch Vehicles: Kosmos 2, R-12, Kosmos 11K63. Launch Sites: Kapustin Yar, Kapustin Yar LC86/1, Kapustin Yar LC86/4. Agency: MO, Yuzhnoye. Bibliography: 2, 6, 99, 12288. 1967 June 16 - . 04:44 GMT - . Launch Site: Kapustin Yar. Launch Complex: Kapustin Yar LC86/1. LV Family: R-12. Launch Vehicle: Kosmos 11K63. Cosmos 166 - . Payload: DS-U3-S s/n 1. Mass: 357 kg (787 lb). Nation: Russia. Agency: MO. Program: DS. Class: Astronomy. Type: Solar satellite. Spacecraft Bus: DS. Spacecraft: DS-U3-S. Completed Operations Date: 1967-09-26 . Decay Date: 1967-10-25 . USAF Sat Cat: 2848 . COSPAR: 1967-061A. Apogee: 555 km (344 mi). Perigee: 288 km (178 mi). Inclination: 48.40 deg. Period: 93.00 min. Specialized orbital solar observatory for measuring solar rays in mulitple spectral zones..
1968 July 5 - . 06:59 GMT - . Launch Site: Kapustin Yar. Launch Complex: Kapustin Yar LC86/4. LV Family: R-12. Launch Vehicle: Kosmos 11K63. Cosmos 230 - . Payload: DS-U3-S s/n 2. Mass: 367 kg (809 lb). Nation: Russia. Agency: MO. Program: DS. Class: Astronomy. Type: Solar satellite. Spacecraft Bus: DS. Spacecraft: DS-U3-S. Completed Operations Date: 1968-11-02 . Decay Date: 1968-11-02 . USAF Sat Cat: 3308 . COSPAR: 1968-056A. Apogee: 546 km (339 mi). Perigee: 287 km (178 mi). Inclination: 48.40 deg. Period: 92.90 min. Specialized orbital solar observatory for measuring solar rays in mulitple spectral zones..